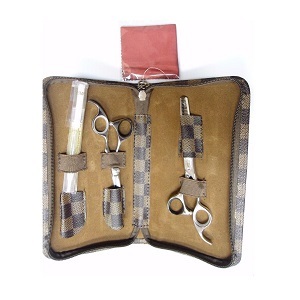 This intro case comes with a Shear, a Thinner, an Oil Brush, Finger Ring Inserts, Cleaning Cloth and Styling Zipper Case. Ultra sharp blade edge effortless cut shears reinforced steel alloy for extra strength. Optimal finger rest positions for effortless cuts with all fingers. Comfort offset handle with special thumb curvature keeps hand relaxed in natural open position. Adjustable leaf spring tension with dial markings for extra precision. Silicone silencer.